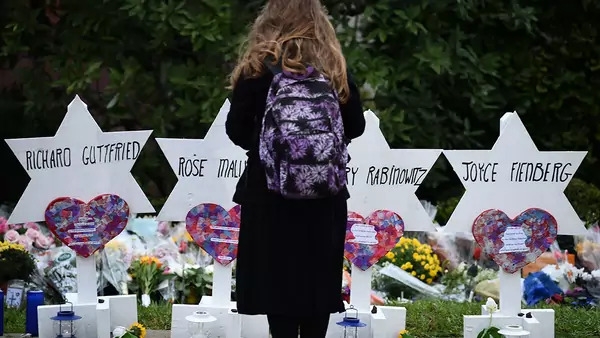 The series of attempted mail bombings and the deadly shooting at a Pittsburgh synagogue this month have once again raised the specter of hate and terrorism in the United States. As public debate intensifies, it is important to understand what the terms “terrorism” and “hate crime” actually mean and why these definitions matter. For instance, both types of crime can carry harsher penalties than other similar violent acts. Both are also symptoms of deep social and political stress, as history has shown. Only once these crimes are appropriately labeled can Americans grapple with their origins. Terrorism is ineluctably political. It represents an intent to intimidate, coerce, punish, or otherwise influence others by violence or the threat of violence because of their political views, affiliation, or position. Describing terrorism is often complicated by gaps between the strict legal definition and more general societal interpretations. Many Americans, for instance, were understandably confused when the term was dismissed by authorities in the context of a shooting at a Las Vegas concert last year that killed fifty-eight people, but then invoked in the case of a vehicular assault in New York City that killed eight people last Halloween. The reason is that it is impossible to determine whether Stephen Paddock, the deceased Las Vegas gunman, was motivated by politics. However, the professed allegiance of Sayfullo Saipov, the Uzbek man charged with the Manhattan attack, to the self-proclaimed Islamic State endowed that act with an undeniable political context. The law enforcement agencies responsible for investigating and prosecuting a violent crime must ensure that it conforms to the definition of terrorism under federal law. In other words, they must be completely confident there is sufficient proof that the act in question was intended “(i) to intimidate or coerce a civilian population; (ii) to influence the policy of a government by intimidation or coercion; or (iii) to affect the conduct of a government by mass destruction, assassination or kidnapping.” Hence, until they conclude their investigation, the FBI and police, as well as the relevant prosecuting authority, are understandably constrained from applying the label to an act that may look like terrorism. The difference, therefore, is not in the way that the crime is investigated, but whether it is prosecuted under terrorism or some other violent-crime statute based on the evidence gathered. Terrorism charges can significantly increase the penalties perpetrators face, and the inevitable media coverage can raise public understanding and awareness of what may be a larger, more sustained threat to society. The terrorism label is just as important to society outside the courtroom, although it can be used in this sphere far more liberally. The term reflects a popular mindset and distinguishes a violent act with political intent and societal messaging from other types of crime. Terrorism, as the title of an important scholarly work explained, is a form of violent communication. Hate crime has its own definition in U.S. law: It is an offense that “willfully causes bodily injury to any person or, through the use of fire, a firearm, a dangerous weapon, or an explosive or incendiary device, attempts to cause bodily injury to any person,” because of actual or perceived race, color, religion, national origin, gender, sexual orientation, gender identity, or disability. What distinguishes hate crimes from other violent offenses are the enhanced penalties. Federal recommendations generally call for hate crime sentences to be some 40 percent longer. It is not hard to understand why in certain instances terrorism is perhaps the ultimate hate crime. Terrorism and hate crimes are by no means synonymous, but they do overlap. Indeed, it is not hard to understand why in certain instances terrorism is perhaps the ultimate hate crime, in that it seeks to subjugate, repress, or simply target people because of their race, religion, ethnicity, or national origin. However, in the U.S. code for terrorism, the perpetrator’s intent is the salient definitional consideration. This may not always be immediately apparent and can only be proven after detailed investigation. On the other hand, the main thrust of the U.S. code for hate crimes is the more often readily apparent identity of the perpetrator’s target—based on race, religion, ethnicity, nationality, or gender. This distinction does not preclude a hate crime from also being terrorism, but, under U.S. code, determining if a violent act is terrorism entails a higher evidentiary threshold and therefore a more painstaking and prolonged investigative process. Neither terrorism nor hate crime exists in a vacuum. Both erupt along society’s fault lines and reflect the era in which they malignantly surface. They are products of atmospheres of acute contentiousness, profound alienation, increasing polarization, and unbridled enmity. Unsurprisingly, America’s worst periods of violent unrest have occurred at times of great stress, societal fragmentation, and political divisiveness. The era surrounding the Civil War is one such example. Another is the period of industrialization, urbanization, and revolutionary communications changes in the late nineteenth and early twentieth centuries, which gave rise to violent labor disputes, anarchist bombings, and political assassinations that within two decades claimed the lives of two U.S. presidents. The height of the civil rights movement and Vietnam War protests, during the late 1960s and 1970s, brought more unrest. There were 2,500 bombings in the United States during one eighteen-month period between 1971 and 1972, according to the FBI. Four decades and a global war on terrorism later, one hopes that Americans would better understand what terrorism is and is not—and how, depending on the circumstances, a hate crime can share many of the same characteristics of terrorism. The public should judiciously use these terms, knowing that their misapplication risks eroding their power to signal crimes with potentially far-reaching sociopolitical implications. Only when a problem is accurately described can its root causes be addressed. With that in mind, there’s no doubt that last week’s mail bombs and synagogue attack conform to the core elements of terrorism. At the very least, both show that the divisiveness, polarization, and intense anger that has historically fueled terrorism and hate is never far beneath the surface.